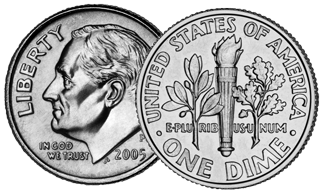 The front of this Roosevelt Dime coin features Franklin D. Roosevelt’s head, and the reverse contains an olive branch, torch and an oak branch. These coins were commissioned when Roosevelt died in 1946 and replaced the mercury dime. This dime is still being minted andn has become a mainstay of the US coin supply. Its long lifespan makes it one of the most mass produced coins in the history of he world.